Lester William Baird, age 93, of Ripon, WI, passed away on Saturday, January 19, 2019, at Maplecrest Manor. Lester was born December 10, 1925 in Rosendale, WI to William and Minnie (Splittgerber) Baird. Lester married Adeline Hoger in 1946. Lester and Adeline farmed on Brandon Road for 30+ years. After Adeline’s passing, he married Marie Redman in 1984. 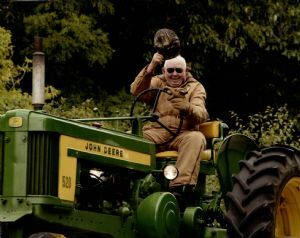 Lester worked at Equity Live Stock and loved farming and restoring John Deere tractors. He enjoyed taking Sunday drives, listening to Tuba Dan on the radio and telling his favorite jokes over and over. Survivors include his son, Leonel (Katie) Baird of Green Lake; daughter, Linda (David) Jantz of Ripon; grandchildren, Lee Katherine (fiancé Mike Stagg) Baird of Green Lake, WI, Chris (Nancy) Baird of Ripon, Ashley (Jay) Roberts of Pickett, Heather (Mike) Mueller of Ripon; 8 great-grandchildren; sister-in-law Dorothy Baird of Ripon; and nieces and nephew, Mary Gabrielski of Ripon, Dale Baird of Appleton and Judy Swan of Sun Prairie. Lester was preceded in death by his parents; wife, Adeline, wife, Marie; brother, Floyd Baird and sister, Velma Lehman. Visitation for Lester will be held on Wednesday, January 23, 2019, from 11:00am-1:00pm at Butzin-Marchant Funeral Home, 515 Mayparty Dr., Ripon WI 54971. Funeral Service for Lester will be held on Wednesday, January 23, 2019 at 1:00pm at Butzin-Marchant Funeral Home. Reverend Bob Rosenberg will officiate. Interment will follow at Woodlawn Cemetery in Ripon. A memorial is being established in his name.